The purpose of this work was to test the resistance to H2S of the nickel upgraded slag oxides (Ni-UGSO), a recent patented catalyst prepared from a negative value metallurgical residue. A previous lab-scale (0.3 g of catalyst) study highlighted that at atmospheric pressure the optimal conditions of autothermal methane reforming, using the Ni-UGSO catalyst are molar CH4/CO2 = 3, CH4/O2 = 2, at 850 °C and GHSV = 4500 ml/h/kg(STP). The present work was performed at these conditions and studied Ni-UGSO deactivation when exposed to 275 ppm of H2S. Two regeneration methods have been assessed: self-regeneration and the regeneration by calcination. At the test conditions, the deactivation of Ni-UGSO took approximatively 2 h with an exponential decrease of CH4 conversion from 92 to 44% (steady state value) and proved reversible. With the regeneration by calcination method, the full activity of the catalyst has been recovered while the self-regeneration led to a partial recovery of the initial activity (77% CH4 conversion). 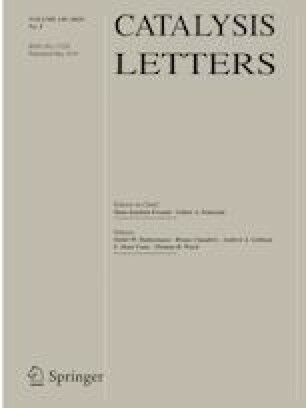 In presence of H2S, Ni-UGSO did not completely deactivate because : (1) its activity is due to a synergistic effect of many elements (not only Ni0) and (2) H2S feeding created a stable equilibrium between Ni0 and NiS, leading to a steady state where Ni-UGSO did not completely lose its activity. 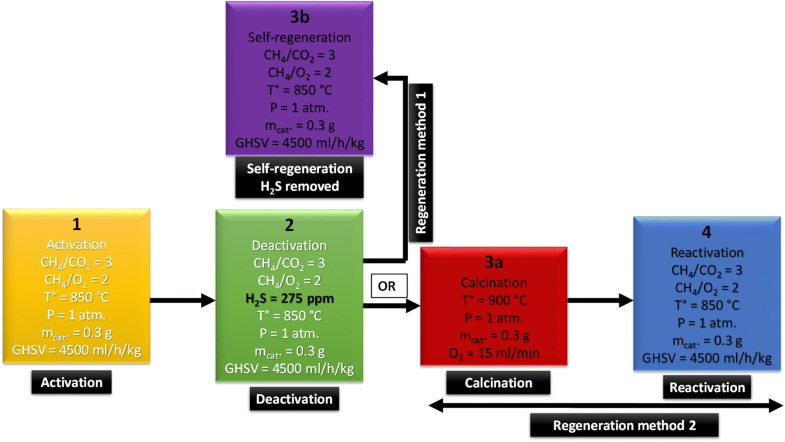 In the self-regeneration regime, the lack of H2S along with the reduction environment leads to a conversion of the majority of NiS into Ni0; since a part of NiS remained, this type of regeneration is partial. As opposed to the above, the oxidative calcination regime worked better because, in presence of oxygen, all sulfur is removed as SO2 and SO3, while calcination leads to the reformation of the initial Ni-UGSO structure through Ni spinellization. This new catalyst appears as a potential good competitor of those described in the literature and used in industry, because, while most of them deactivate completely in presence of H2S, Ni-UGSO, in presence of 275 ppm of H2S loose partly its activity. Its high resistance to hydrogen sulphide and its easy regeneration are highlighted in this article. We would like to thank FRQNT (Fonds de Recherche du Québec: Nature & Technologies) and the company Rio-Tinto Iron and Titanium (RTIT) for the financial support of this project. Special thanks to Dr. Mostafa Chamoumi, post-doctoral fellow in the GRTPC & P (Groupe de recherches sur les technologies et procédés de conversion & pharmaceutiques) of the Université de Sherbrooke, for his scientific and technical support as well as Mr. Guillaume Hudon and Yves Pépin of RTIT for providing the catalyst support (UGSO). The contribution of the technicians Mr. Stéphane Gutierrez and Mr. Carl Saint-Louis of CCM of Université de Sherbrooke (Centre de caractérisation des matériaux) are also gratefully acknowledged.